Of the many lessons Kathleen Blatz ’76 took from Notre Dame, the one she says mattered most was not learned in a specific class or from a certain professor. Rather, it was the entirety of her educational experience—from studying abroad in Rome to diving into art history to exploring anthropology—that broadened her perspective on life and helped shape her own path. “You don’t go to college to learn a skill; you go to think differently and broadly, to appreciate that the world is a lot more complicated and diverse than your silo of life experience,” says Blatz, who majored in sociology. When Blatz became chief justice of the Minnesota Supreme Court in 1998, she found that lesson to be particularly useful as she heard arguments and delivered decisions on some of the state’s most contentious and important legal disputes. “You can’t just live your life on one side of a case—that’s just the opposite of an Arts and Letters education,” she says. “I’ve had to experience all kinds of points of view. Blatz says she selected sociology as her major because she had an interest in human relationships. "I love interrelationships," she says. "That had a lot to do with my choice." Blatz went on to receive a master's degree from the University of Minnesota School of Social Work before going to law school. As part of her master's program, she completed hundreds of hours of real-life social work, first as a probation officer, then as a social worker at a veterans clinic, and then as an outpatient counselor. "My social work background has helped me," she says. "Law is a helping profession at its core." Blatz’s legal career has been as varied as her earlier educational experiences had been. 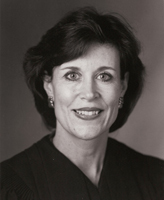 Before becoming chief justice, she was an associate attorney in a large Minneapolis law firm and held positions in both the executive and legislative branches of government, serving 15 years in Minnesota’s House of Representatives and, later, working as a part-time prosecutor in the Twin Cities handling child-protection cases. She also served as a trial judge for three years. Blatz says these different experiences prepared her for her 1996 Minnesota Supreme Court Associate Justice appointment. Two years later, the governor then appointed her chief justice—the first woman to hold the office in the state’s history. As chief justice, Blatz oversaw the state’s entire judicial system. She shepherded the court’s biennial budget through the legislative and executive branches, helped reform the state’s child protection system, and led the Children’s Justice Initiative, which worked to get abused and neglected children more quickly out of foster care and into safe and permanent homes. Working in a job that encompasses such a wide variety of issues, Blatz says she is thankful for the many different types of classes she took at Notre Dame—for what they taught her and for what they showed her she still needed to learn. As a result, she says, she constantly strives to become fully informed about what’s in front of her, a commitment to continuous learning that has been integral to performing her duties as a judge. As her own children embark on their college education, Blatz says she finds herself offering them the same advice she would tell any young student at Notre Dame. International, cultural experiences such as these are crucial to part of what Notre Dame offers students, she says. “I think the school’s institutional core has always been its Arts and Letters education. It’s deep, it’s not an afterthought. In many ways, it’s who Notre Dame is. Originally published by Mary Kate Malone at al.nd.edu on October 18, 2012.